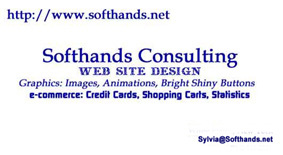 Softhands Consulting, LLC mission is to provide our client with a face on the internet that reflects their interests, business and satisfies customers' needs. Our newest venture is ebook publishing. We provide Adobe pdf as well as other ebook formats. For our clients we provide web site design, web development, graphic design and marketing. Softhands creates the web presence for its clients that best represents their business. and the visual representations that are meaningful to their customers. Programming is used to implement complex support as required for the site. In some cases, off the shelf capabilities can be used at lower cost.